It has been a busy week at SC Carts, and part of that included the continuation of this cool build! This week we installed the painted roof, buttoned up some wiring and gave the floor a custom look…check it out! The silver roof got installed, and it looks awesome! But we aren’t completely done with the roof yet, there is another custom touch coming. 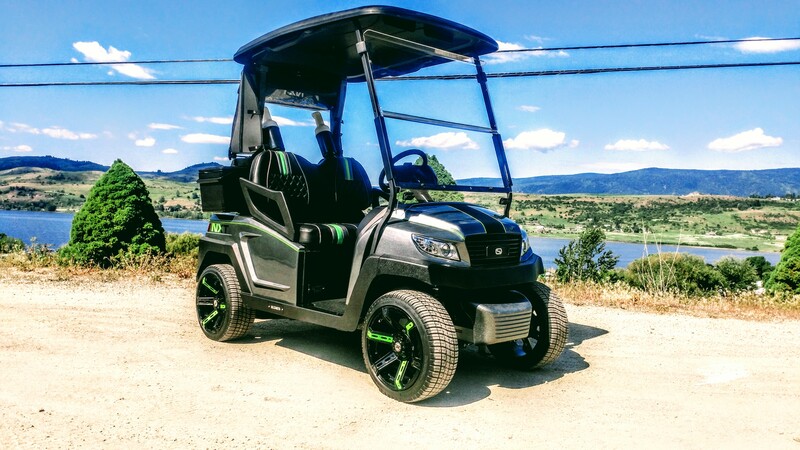 Our customer decided the stock wheel just wasn’t cutting it for this great looking cart, so we opted for a carbon fiber wheel. You can see how nicely the steering wheel ties in with the seat upholstery. Our customers still like to be able to hold their score cards with their custom steering wheels, but they don’t want to cover that beauty up when they aren’t keeping score…so a clear score card holder does the trick! Next we buttoned up the wiring using a column cover to run the gauge wiring and signal/light wiring in. Here’s another shot showing how clean the steering column looks, we still have to button finish up the dash area, but it’s coming along! Also if you hadn’t noticed, how about the custom SC Carts floor mat and side sills package. It’s all in the details, that’s what sets an SC Carts custom cart apart from the heard, here you can see our side sills match the round holes in the wheels. Well that’s where we will leave off this week, we are going to take a break from this build next week as we wait for more parts to arrive…yes this cart is going to get even more awesome! Until then checkout the last build post and be sure to come back soon to see more progress on this beauty. Don’t forget to head to our Facebook page we have a to going on!